The Pleiades star cluster as seen from midnorthern latitudes on the evening of April 1, 2006. If you live anywhere in eastern North America and the evening sky is clear on Saturday, April 1, look for the thin crescent Moon in the western sky right after sunset. If you have binoculars or a telescope, make a special effort to look at the Moon. Peering through the eyepiece you will be treated to a very beautiful sight. No fooling! I can speak from experience, since I've seen it before. The crescent Moon was hanging low in the western sky like an eerily illuminated ball. Indeed, I could readily see the full globe of the Moon, with its darkened portion glowing with a bluish-gray hue interposed between the sunlit crescent and not much darker sky. This vision is sometimes called "the old moon in the young moon's arms." Leonardo da Vinci (1452-1519) was the first to recognize it as earthshine. That faint bluish-gray light is light from the Earth reflected back to the Moon. The Earth's light of course is reflected sunlight, so earthshine is really sunlight which is reflected off Earth to the Moon and reflected back to Earth. Such an earthlit crescent is always a gorgeous sight, but on that March evening in 1969 it had as a backdrop a beautiful array of stars of varying brightness scattered around it. For on that evening, the Moon was crossing in front of the famous Pleiades Star Cluster. For more than two hours I watched in fascination as the Moon slowly covered and uncovered a number of the "Pleiads." The brightest stars of the cluster mimicked tiny blue gems, disappearing first behind the Moon's dark side-almost seeming to penetrate the lunar limb slightly before winking out-and then reappearing less than an hour later from behind the bright crescent. The overall view appeared strikingly three-dimensional and has not diminished in my memory even after nearly four decades. This year on April 1-also a Saturday-a delicately thin crescent Moon, 2½-days past New phase and just 16 percent illuminated-will again cross in front of the Pleiades, part of a series of monthly Pleiades occulations currently occurring worldwide. Over the eastern half of the United States and Canada, the occultation will already be underway as the sky darkens and evening twilight fades. The Moon will be about one-third of the way up from the western horizon and will remain in view for roughly 3½ hours after sunset until it finally sets. During that interval, observers will be able to watch as the Moon's dark limb gradually approaches one star after another; the stars will appear to suddenly "pop-off" as if someone threw a switch. The stars will reappear from behind the bright lunar crescent about an hour later. Unfortunately, those who live from the Plains States and Prairie Provinces of Canada and all points west will miss out on the occultation, as the Moon will have already moved past the Pleiades by the time darkness has fallen for these regions. Nonetheless, the view in binoculars of the crescent Moon sitting just above and to the left of the star cluster will still make for a very pretty sight. Below I have compiled two timetables giving local circumstances for the disappearance and reappearance of the seven brightest members of the Pleiades. The information is valid for eight U.S. and two Canadian cities. Approximate times for other locations can be guesstimated by way of interpolation. Keep in mind, however, that many other stars not listed here will also be occulted. Take note that if the disappearance or reappearance of a star occurred prior to the end of nautical twilight (roughly an hour after sunset), I assumed that the sky will be too bright to easily see it. In addition, the Moon might miss the star entirely. In both such cases, the time is omitted. All times are in local standard time. Some stars will appear to come tantalizingly close to the Moon, but will not be hidden. In the most extreme case, a grazing occultation will take place: a star appears to wink on and off several times as it passes behind craters, mountains and valleys right along the Moon's edge. In order to see such a spectacle, however, you must be positioned along or within a mile of the graze path. The star Maia will appear to be grazed by the Moon's dark northern limb along a line that will run from roughly northern portions of Illinois and Indiana to central Ohio (just north of Columbus), to the northern suburbs of Washington, D.C. The star Taygeta will also appear to be grazed by the Moon's dark northern limb along a line running from northern sections of Mississippi and Alabama, central Georgia (near Statesboro) to southernmost South Carolina (near Hilton Head Island). 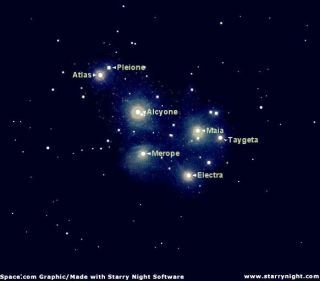 Alcyone, the brightest Pleiad, will be grazed by the Moon's bright southern limb as seen from parts of southern Texas, the Louisiana Gulf Coast and southern Florida. The graze line passes over Houston and Miami.